These "divine" crackers are definitely beyond my wildest dreams. One taste and you are almost in a blissful dimension where you don't quite know what you are tasting, but you love it and want more. The ingredients include: Unbleached wheat flour, organic stone ground corn, organic stone ground wheat, water, organic canola oil, olive oil, dried onion, granulated garlic, salt, yeast and sea salt. The Wildest Dreams crackers also contain dried cranberries and ground black pepper. They are peppery and sweet and go very well with most cheeses, but you may find your self snacking on them and also hiding them from everyone else so there are some left the next time you want to enjoy these very gourmet crackers. The flavor of cheese can be buttery, rich, pungent, sharp, salty or delicate. Cheese is made from nutritious milk. The type of milk adds subtleties to each cheese and makes it unique. I enjoy Mozzarella made from buffalo milk.While I am hardly a Turophile (A connoisseur of cheese), I may soon become one after reading this book. "Tyro" is Greek for Cheese and "-phile" means "lover of." If you are a border-line Turophile or are just curious about cheese, I recommend this book very highly. This is so much more than a cookbook. It is a love affair with cheese! There is a concise overview of cheesemaking, a collection of over 150 eclectic cheese-based recipes and a comprehensive list of sources for your favorite cheeses. After working in a specialty store, I decided to try a different cheese as often as I could. I learned to love smoked Gouda, creamy Havarti with dill, Pecorino Romano from sheep's milk, blue-veined Roquefort in salad dressing, Provolone in an Italian salad, Ricotta in lasagna, and lately Mascarpone in Tiramisu. In "The Cheese Lover's Cookbook and Guide," Paula Lambert provides many unique recipes using Mascarpone, but how is Marscarpone made? Believe it or not, there is a recipe on page 73. Finally, you will know the secrets of Crème Fraîche and discover how easy it is to make homemade cottage cheese. Yes, Paula Lambert is ambitious and creative. She has the heart of an artist, the soul of a chef and the spirit of a cheese artisan. "The Cheese Lover's Cookbook and Guide" is truly filled with a passion for cooking with cheese. Paula Lambert also loves to travel. After spending five years in Perugia, she learned to love fresh mozzarella. Her search to learn how to make fresh mozzarella resulted in the founding of "The Mozzarella Company," a cheese factory in Dallas, Texas. With the guidance of a cheese professor, Paula immersed herself in the cheese making process and went on to produce thirty-five different types of cheese. These cheeses are now distributed to restaurants, gourmet stores and directly to individuals throughout the United States. Paula Lambert has become a renowned cheese maker. Her cheeses have earned over seventy awards for superior cheese flavor and consistency. In order to perfect traditional cheesemaking techniques, Paula traveled to many countries. Her enthusiasm shows how fascinating the art of cheesemaking can be. I loved her section on Cheese Classification. She divides cheese into over 15 categories and illustrates them with common and exotic cheese varieties. Did you know that Mozzarella is classified as a Pasta Filata Cheese? I didn't either. 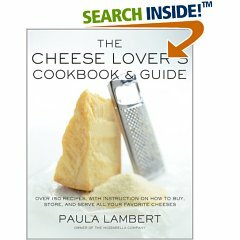 Paula also includes a nutritional breakdown for many cheeses, a cheese-buying guide, a list for substituting cheese by type, a list for selecting cheese by flavor and finally a list for selecting cheeses by country of origin. She includes a helpful section on mail order cheese sources, complete with Web site information, which is very thoughtful. Most cooks agree: If you find one memorable recipe in a new cookbook, it is worth the price. 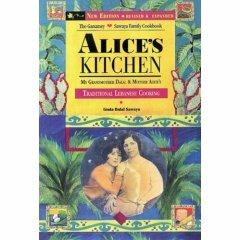 In this cookbook, you will find so many recipes you will love! The picture of the Ricotta Pancakes with Banana-Pecan Syrup may just inspire you enough to make it the first recipe you want to try. I made them and they are delicate and almost cake-like. The heavenly sauce is a combination of pecans and bananas sautéed in butter with maple syrup. I used real maple syrup. Most of the recipes are influenced by a prominent culture or are influenced by "fusion" cooking. The "Cheddar Cheese Grits with Roasted Garlic" is definitely Southern." The "Risotto with Asparagus and Parmigiano" reminds me of Italy. The "Ultimate Cheese Omelet" is very French. Since Paula lives in Texas, she also has a flair for using local ingredients. "Southwestern Chile-Cheese Corn Bread" is an example. Paula's recipes have a touch of sophistication and are easy-to-make gourmet treats. I loved the Bacon, Egg and Cheddar Scones! Each recipe is presented on its own page, or two. You hardly ever have to turn a page to complete a recipe. The headings are bold, the headnotes are interesting, and the instructions start with a few words in a gold text, which is quite pretty. Paula's writing style is easy-to-read and her precise instructions are very helpful. The hints on decorating are wonderfully unique. I loved the dragonflies made from bell peppers on the "Savory Herbed Cheesecake." These are the types of recipes you will want to add to your kitchen repertoire. The 16 full-color photo illustrations will inspire you to go shopping for cheese. Some of the recipes are modernized classics. "Bacon, Egg and Cheddar Scones," "Apple Pie with Cheddar Crust" and "Grilled Shrimp and Smoked Mozzarella Pizza" are good examples. Many are perfect for Holiday entertaining. "Baked Brie with Mushroom, Walnuts, and Dried Cranberries," will be spectacular. There are soups for winter and salads for summer. 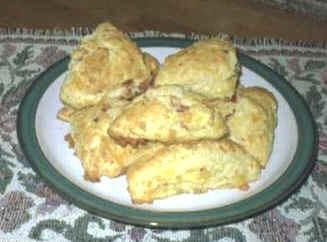 I just made the Bed & Breakfast style "Bacon, Egg and Cheddar Scones." They will have you saying: "More Cheese Please!" This is truly a dreamy cookbook for all cheese lovers. Thank you Paula, you are an inspiration to us all! Linda Dalal Sawaya presents a cookbook with a beautiful warm personality, filled with recipes for: Appetizers, Cheese, Yogurt, Butter, Sauces, Soups, Salads, Lamb, Chicken, Fish, Vegetarian Entrees, Vegetables, Beans, Grains, Breads, Sweets, Preserves, Beverages, Herbs, Spices and Fragrant Waters. Alice's Kitchen is a world of Lebanese cooking that gives insight into how life was lived in Lebanon and how a family adapted to buying ingredients in America while living in California. Linda Dalal Sawaya tells the story with humor and we learn about how her family maintained their traditions despite a variety of obstacles. Each recipe is set out in a way that is easy to follow with step-by-step instructions and plenty of pictures throughout to keep you entertained. The pictures and the family stories make this book collectible and the recipes bring the warmth of Lebanese cooking into your home in a way that is very accessible. The ingredients include spices and herbs like parsley, paprika, cinnamon and allspice. Lemon juice and olive oil are used throughout the recipes. Pomegranate syrup and orange blossom water are very easy to find these days, especially online. Most of the recipes use ingredients you can find at your local grocery store, but you might want to order some "zaatar." This book made me long for my childhood overseas when we had Lebanese friends who always made delicious dinners and taught me to make a spinach dish with yogurt and cheese. My dad also used to make fig jam from a tree in our backyard. So, this book was filled with lots of memories and introduced me to a world of treasured memories as shared by Linda Dalal Sawaya. As you cook from this book your home will be filled with the scents of fragrant spices, warm syrupy baklava, rose, lemon, anise, coffee, doughnuts, buttery cookies, fresh bread, lamb with rice, and of course, garlic! 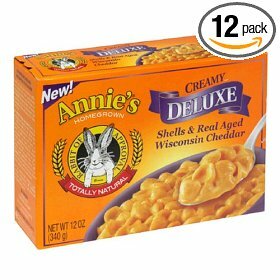 Annie's Creamy Deluxe Shells & Real Aged Wisconsin Cheddar is made with all vegetarian ingredients and even organic pasta. The sauce is made from cheddar cheese, cream, whey, dry milk, natural flavors and annatto for color. The 12-ounce box is enough for two to six people depending on how hungry you are at the time. We serve this as a side dish with many meals and normally can get about four to six servings from one box. When making the pasta, use a large stockpot filled halfway with water because if you even use a medium to large saucepan, it might boil over. The instructions say to use a medium saucepan, but I can't recommend that personally as it always boils over. Once you have the pasta cooked, all you do is add the packet of creamy delish cheese sauce. This is probably the only box of macaroni and cheese with information on where to get a "Be Green" bumper sticker. I also like the cute "Rabbit of Approval" sticker on the Annie's Homegrown products. They are all delicious (not overly salted) and you feel good eating such a healthy product.